I watched Hikayat Merong Mahawangsa 3 times within a span of 5 days. The first time it was by the spur of the moment when my buddies from Singapore came for a visit and we were at KLCC. And that first time impressed us to no ends, I decided to take the husband along for my second helping. He was bought over, impressed with the scriptwriting and language used. He even said that he would actually watch the film for the second time just for the language alone. My third time was a couple of days later, accompanying a friend who enjoyed it just as much. Just now, the husband took his mother to watch it as a sending off movie date as she is flying back home bound for Germany in a few hours. She likes it, although she depended largely on the subtitles. I didnt go with them as I was working. It would have been my 4th time had I gone. Not that I mind. This is the first ever local production I watched more than once in the cinema. It is also the first ever local production I would actually give a standing ovation to. If you have not watched it yet, go already! Come Monday, I may be watching it again, bringing in another guest from home to experience a piece of local awesomeness. The first book which I learnt to ‘read’ as a toddler, even before my very first story book (which was Chicken Licken) was actually ‘Lat the Kampung Boy’. My old man was a fan and he used to keep the book in the low drawer beside the stereo. Of course as the toddler then, I couldn’t resist ransacking the drawers, taking this coveted book out and leafing through it (and destroying it in the process). As a first time mother, mine couldn’t resist capturing it all on camera. That was how I knew that my first encounter with a cartoon character was that with a rotund, bushy haired village boy who later turned quite famous indeed. On Saturday, we went to watch Lat the Kampung Boy musical which was directed by Hans Isaac and Harith Iskandar. When the promotions for the musical was advertised, I had anticipated it to be an awesome production in which I wouldn’t mind paying to watch again. I had even earlier wanted to take my old man to watch it, but he declined for some reason. On how we came to possess a set of tickets with good seating arrangements at a quarter of the price is another story altogether. And so we went, my husband, my friend and I.
I was initially amused that Awie was chosen to play Lat. Overall, the musical was not that bad, but good is not what I would personally describe it as. They have good talents in the cast, but I find that the talents didn’t gel. Awie’s chemistry with co-star Atillia was zilch, although as a saving grace, both of them were really talented singers. Atillia was impressive there and that surprised me, because when she first started, we heard her sing at the concourse of Cineleisure Curve while having bubble tea at the Taiwanese shop. And we were wondering WHO is this wannabe? The first half of the musical was draggy. I dozed off for several moments, and I have never done that at any musicals before this. The opening number was nice and catchy though, but that was it. It crawled on till intermission time where we had that glimmer of reluctance to go back in for the second half. But we did and we were glad because the second half was way better than the first half. If their strategy was to save the best for last, it was indeed a risky move because I was quite sure some audience did leave during the intermission and didn’t come back. I enjoyed the second half, especially that of the Frankie character. He was hilarious. I would give the musical a 6 out of 10. Probably Awie, in my eyes failed to bring out the Lat character the way I had imagined it to be. The draggy first half didn’t help either. However, despite everything, I would give 2 thumbs up to the set design. It was as though the book came alive and I was seeing it in 3D. We were at Istana Budaya last night and towards the end I felt like I should run up the stage and give Erma Fatimah a big hug, for directing something so awesome. And being mentally and emotionally stuck in the 80s, it felt as though I was given a lil treat of sorts with Susan Lancaster, Sofea Jane and Ziela Jalil on the same playing stage. I like the cheekily creative way Erma explored with the musical numbers, with a pinch of influence from Slumdog Millionaire and Ip Man. It was a splendid showmanship alright, with a tiny flaw of casting Aaron Aziz as Burhanuddin Helmi. The latter, in history was one heck of an influential youth leader who was supposedly charismatic and ‘bersemangat dalam menyemarakkan’ the emotions and sentiments which were instrumental in the protest during the tragedy. But Aaron, bless this Pasir Ris mat succeeded in mellowing it down by saying out his ‘influential’ speech like a pre-puberscent teenager running for the prefectorial board. 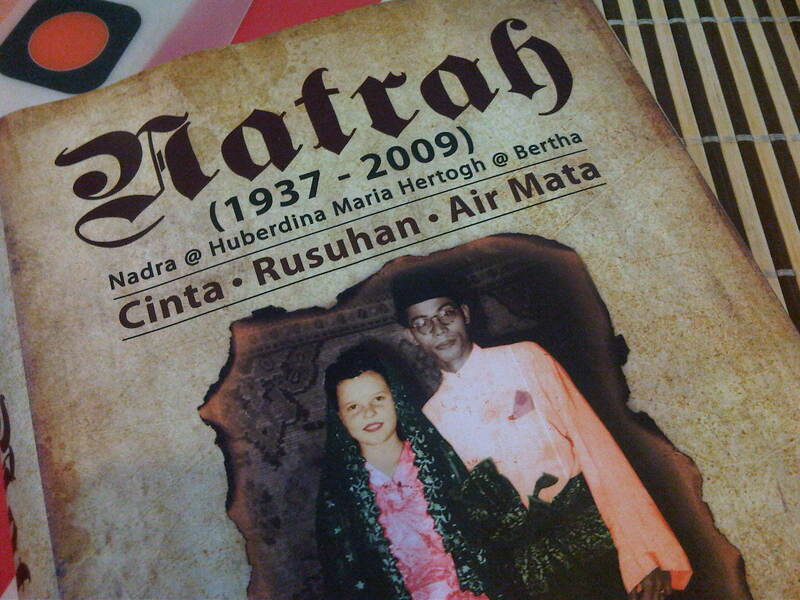 And I simply love the Maya Karin-Remy Ishak combination as Natrah and Mansor. They may not look anything like the real ones on the cover of this book we bought at the lobby of Istana Budaya, but they both got charm and chemistry and more importantly theatrical showmanship. We went to visit Aunty Meena for Diwali. When we called her to say we were coming, again, she sounded excited. She didn’t allow us to come on the first day of Diwali. She gave the reason that so many people would be at her house on the first day. We knew. Her living room is smaller than my master bedroom and with her siblings and nephews and nieces, she didn’t want to cramp us in like how we experienced 3 Diwalis ago. Not that we minded, but she seems to want to give us the exclusive Diwali visit, in the most endearing way she knows how to. Some of her Diwali goodies. She makes wicked Muruku, something I always look forward to. She’s a very pious Hindu and there are many of these deities in her house, which she carefully cleans daily. Her mean briyani… I love, love, love her briyani. To the point I told her to stop cleaning people’s houses and open a briyani stall. Training was right after the visit. The briyani made us sleepy like lazy dugongs but we dragged our full selves to Bangsar for training. After training, our gis were soaked with sweat and I never felt so good. My gi was literally soaked with (liquidified) ghee and now I have a headache as I am typing this down. I’m not sure if it’s from the ghee from the briyani or from the overdose of curry and muruku or that training today was tough. Either way, our Diwali was good! And for once in a whole month, I regretted taking the pics with the BB. The house was dark and the flash function from the BB is not strong enough, hence the photos didn’t really bring out the true colours of Diwali as we experienced it. This weekend we will rest from training as our teachers are in Jakarta to meet and have teacher’s training course with TheSensei. As such both of us decided to have our date night last night with a movie watching Donnie Yen in TheLegendOfTheFist:TheReturnOfChenZhen. As much as I like DonnieYen, no… correction. I love Donnie Yen especially in the last two WingChun films he played as IpMan. Last night’s choice of movie was solely based on the fact that DonnieYen was in it. The husband loved the movie while to me, it is just another Sino-Japanese war film, Donnie’s presence in it notwithstanding. But the film was way too graphic, on the atrocities of the Japanese war. There were some hilarious moments ala Hindi movie as well, like Donnie fought and won the entire dojo of the Japanese martial artists and how, when at the very last moment when he was to fight the Japanese general, muscles suddenly bulged out of his whole body ala incredible hulk. I let out half a guffaw when I felt the husband’s humongous hand cupped my mouth in his attempt to shut me up. During the film, my mind wandered a bit. My late grandfather lived through the Japanese war and in my primary school days I remember his rendition of ‘Jepun jahat!’ ‘Jepun zalim’, referring to the atrocities done by the Japanese soldiers to the locals, especially the Chinese. Hence, I do wonder sometimes, had he still been alive today, what would he think of the very fact that I, his first and most coveted grandchild, is married to the first and most coveted grandchild of a former Nazi.soldier/Nazi.female.youth.winger who were part of the Axis forces together with the Japs, and both of us are devoting more than half of our time learning the ancient martial art of the very people whom he called ‘orang jahat’ ? In one of the years in the last decade, Hari Raya coincided with Chinese New Year and I remember having a conversation about our respective celebrations with a colleague by our cubicles at work. Then in her 30s and not yet married, on top of that being single and not dating anyone, I remembered her telling me that she was going to make use of that long holiday for a trip to somewhere nearby and just chill out. Of course, at that time I just laughed it all off with ‘ thank God my Hari Raya is not that drama’ comment. Firstly, I don’t remember any of my relatives being that orally brutal, secondly, I had the answers to the questions all ready in the mental suitcase. I was in my early 20s, just starting my career, had a boyfriend then (whom fortunately did NOT become my husband!) and hence I was in the comfort zone of ‘ask them silly question and thou shalt be answered!’. I was not as unlucky as my colleague then. However, my ex-colleague was one of the probably thousands out there who are victims of what I term as ‘people with low SQ’. SQ, or ‘Social Quotient’ refers to the measure of social skills one has, not unlike IQ or the level of intelligence in a person or the much talked about EQ- emotional quotient these days. I have been observing for many, many years, (and have also occasionally been a victim of some), on how people with low SQ prey during the festive seasons, when they know that everyone is listening. Festive seasons are times when families and extended families meet and be merry. Friends who have lost touch meet again, to renew ties and ask for forgiveness or for the good old times sake. On paper, festive seasons are joyous occasions indeed, time to look forward to and get excited about. But on the contrary, festive seasons can be the leper or the pariah to be avoided by many individuals, for fear of their encounter with relatives with low SQ. In laymen’s term ‘foul mouth/insensitive/mulut longkang/askstupidquestions/purposely set out to embarress/etc’. and it goes on and on. The above are collections from personal friends. If you have been a victim of these low SQ relatives, feel free to add on. It has, however been pointed out to me that these relatives, most of which are in the makciks/pakciks category (although the pakciks during raya usually start any meetings of sorts by bitching about Malaysian politics, and I am not kidding! ), they intended no harm. It is just their way of starting conversations and that’s the only way they know how to do it, by attracting attention to themselves, by picking up a scapegoat to be laughed at or by joking. Yes, they really think that they are joking, these low SQians, although no one else finds their remarks or jokes remotely funny. In my humble opinion, whether or not they intend any harm, it is rude. Period. No one should be made the scapegoat of entertaining others, especially about something that is so personal. So. For those of you who have been victimized by these low SQians or in my term ‘social retards’, there are proactive measures you can take. 2. Pretend that you have blocked ears because water from the shower went all the way in. 3. Entertain their FAQs. And for the suggestions to their FAQs, I have some, in case they are useful for you, please feel free to use them. – ‘Rumah saya takde bilik. Tidur dalam khemah kat East Coast? Makcik nak join? Boleh kita buat bbq’. – ‘Kereta saya besar makcik. Brand KTM. Makcik sekaum sepuak nak tompang pon boleh’. But of course, if you were to use any of the above, do it tongue in cheek, not in rudeness. Do not stoop to their level by having no manners yourselves. Treat it as a big joke and then laugh it all off afterwards. And then, one can really see that it is really silly to be affected by these low SQians come every festive season or weddings or any events in which relatives and friends gather. May I also suggest Radio Warna/Ria do a segment on these? With more awareness of social quotient, together we can make the supposedly beautiful festive season a less stressful period for many individuals, whom I know are dreading it year after year. I bowed out halfway through training just now because although my mind told me to persevere, my body had other ideas. I have not been sleeping well for many nights, being chased by deadlines yet again, accompanied via mixpod by Nuno notwithstanding– all night long, Lionel Richie would be proud of me. While the rest were being thrown and pushed on the dojo mats, I was slumbering at the corner, slumped against the water-cooler in a sleep so deep, I could have missed Katrina hurricane had it happened. But I woke up just in time for the end of the class, where the senpais or senior students shared with us their experiences as they proceeded higher into the grades. And one of which I found intriguing. One of the lessons sensei would make them do is to pull a long piece of string or hair from a tray of flour, to test for their ‘centre’. To pass the test, the hair would have to be pulled out straight without messing up the flour for even a teeny weeny bit. The proverb refers to the act of handling a delicate situation with so much care as such, no parties involved are negatively affected. Sticky situation. So I have to be prepared for this test and I can only pass it with a fully developed centre. By the look of it, I will end up with a strand of broken hair and flour all over my face like the Malay kueh, tepung gomak. It’s ok. The Chinese say ‘ Man man lai’. Slowly, slowly come. In aikido, 11 years is still considered a baby in this art. My 3 plus years in it is nothing, but womb period.